Balloon pulmonary angioplasty (BPA) has emerged as a new treatment strategy for patients with chronic thromboembolic pulmonary hypertension (CTEPH). Improvements in hemodynamic parameters after BPA have been reported, but some patients continue to suffer from reduced exercise tolerance even after the normalization of hemodynamic parameters following BPA. As the amelioration of hemodynamic parameters is reportedly achieved via BPA, we hypothesized that the limiting factors for exercise tolerance in these patients are related to respiratory function. Therefore, we investigated the associations between respiratory function and exercise tolerance, and the mechanisms underlying respiratory dysfunction in patients after BPA. We analyzed 62 patients with CTEPH who underwent 1-year follow-up after BPA. Predictors for reduced exercise tolerance after BPA determined with six-minute walk test were sought from pulmonary hemodynamic and respiratory parameters using logistic regression analysis. 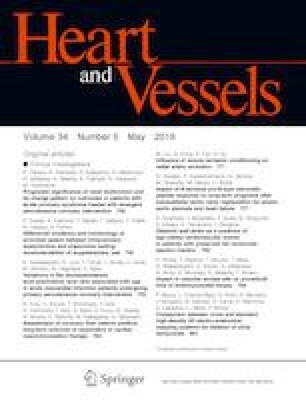 After multivariate adjustments, high mean right atrium pressure (mRAP) and high alveolar-arterial oxygen gradient (A-aDO2) were significant predictors for reduced exercise tolerance. Next, we analyzed factors associated with high A-aDO2. Among the pathophysiological causes of high A-aDO2, including ventilation, diffusing capacity, and low ventilation-perfusion ratio, only low ventilation-perfusion ratio caused by high intrapulmonary shunt fraction was associated with high A-aDO2. Impaired oxygenation due to residual high intrapulmonary shunt fraction was associated with reduced exercise tolerance in patients with CTEPH, after receiving BPA. The online version of this article ( https://doi.org/10.1007/s00380-018-1306-2) contains supplementary material, which is available to authorized users. Authors thank staffs of department of respiratory physiology in Keio University School of Medicine. The authors have nothing to declare regarding the contents of this manuscript.